A secret cargo of spent nuclear fuel from the Czech Republic arrived at the Atomflot port in Murmansk on Monday aboard the Mikhail Dudin in another delivery that skirted the coast of Norway, causing officials here consternation over not being notified of radioactive cargo off their coast. Such muffled cargos to Murmansk have raised hackles with the Norwegian government, the environmental community, and Murmansk’s population of 300,000 before. But according to Andrei Zolotkov, director of Bellona Murmansk, the transports are part of a US-Russian agreement called the Global Partnership, which repatriates spent research reactor fuel from the former Soviet Bloc. Zolotkov did, however, raise questions as to whether the Mikhail Dudin was certified to carry such cargos and said he had yesterday sent an inquiry to Atomflot. He said such inquiries typically take several days to answer. 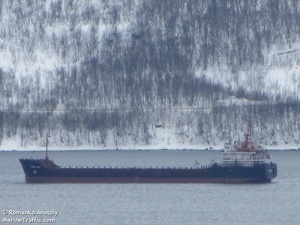 The Mikhail Dudin delivered some 82 tons of spent nuclear feul to Murmansk, according to Norwegian media. Yet, while other environmental organizations in the Murmansk area decried the secret shipment, Zolotkov insisted that keeping shipments like the one delivered earlier this week under wraps was essential to avoid acts of terrorism. “There is nothing unusual about this shipment at all, and no reason for anyone to turn it into a scandal,” said Zolotkov by telephone from Murmansk today. Nils Bøhmer, Bellona’s general manager and nuclear physicist, however, said that the transports must at least be disclosed to Norwegian authorities so they can help if anything goes wrong. But the director of Norway’s Radiation Protection Authority Ole Harbitz told the Barents Observer news portal that he had received no information about the Mikhail Dudin’s shipment as it traversed the Norwegian coast last week – and this is far from the first time this has happened. The spent nuclear fuel is expected to be delivered from Atomflot by rail to the Southern Urals reprocessing site at Mayak. Zolotkov explained that other radiological hazards surrounding Murmansk Harbor dwarfed the spent fuel transports. One such hazard, he said, was the nuclear service vessel Imandra, which sits at Atomflot with some 1000 spent fuel assemblies that are not stored in containers. Zolotkov also reeled off other radiological hazards to the Murmansk region, not the least of which is the former navel spent nuclear fuel site at Andreyeva Bay. Mikhail Dudin certified to carry nuclear cargo? The vessel MCL-Trader has made several deliveries of former Soviet spent nuclear fuel to Russia both via Murmansk and St. Petersburg. Recently the Mikhail Dudin has been making radioactive deliveries, implying that it, like the MCL-Trader, is certified to do so, according to the sosnycompany.com website. The MCL-Trader underwent a series of retrofits in 2008 so it could carry nuclear cargo, but sosnycompany.com lists no dates for the Mikhail Dudin’s retrofits. The ship’s entry on marinetraffic.com lists the vessel, which was built in 1996, as being certified for dry cargo. The website of the Paris Memorandum of Understanding on Port State Control, which monitors ships’ repairs and safety records, listed both the MCL-Trader and the Mikhail Dudin as “general cargo” ships, making no reference to upgrades enabling them to carry nuclear cargos. On all sites, however, the Mikhail Dudin was listed as being seaworthy for its dry goods shipping class. Bøhmer insisted on the transparency to Norwegian officials of nuclear shipments off Norway’s coast, even through international waters. But the Russian government persistently flouts notifying Norway about these shipments. The first such hushed shipment from Poland took place in 2009. In 2010, a Danish vessel carried some 54 kilograms of nuclear waste to Murmansk from Serbia. Russia’s state nuclear corporation Rosatom didn’t notify Norwegian officials until after the load had landed at Atomflot. In the same year, the MCL-Trader docked in Murmansk with 450 kilograms of Russian origin highly enriched spent uranium from Poland and Germany. Norwegian authorities were again not alerted. “This is not the first transport of nuclear waste through the port of Murmansk, and the government, as usual, hid it,” says Vitaly Servetnik with Kola Environmental Center to the Barents Observer news portal Wednesday evening. “Only public awareness can draw attention to such transports,” he says. After picking up its cargo of nuclear waste from a Czech research reactor, the Mikhail Dudin sailed toward the North Sea and northbound along the coast of Norway towards the Barents Sea. The vessel likely sailed outside Norwegian territorial waters, said the Barents Observer.